Important: If you’re here, you’ve likely already completed Levels 1 & 2 of the Digitizer’s Dream Course & seen first hand why our superior education has helped over 10,000 students learn how to digitize. If you haven’t, I highly recommend that you begin there as they are prerequisites for Level 3 and theory covered in those levels is extremely important. This level will continue where Level 2 left off & focuses on the attributes of the 3rd and final primary stitch type in machine embroidery: the fill stitch. Whether you want to be able to truthfully tell your family & friends “I made it from scratch”, make some extra money with embroidery, or simply better your embroidery self, the ‘Digitizer’s Dream Course’ is perfect for you! The name of our site says it all: ‘Digitizing Made Easy’. 1.5 hours of interactive video which is split into 4 bite sized video lessons taught directly in the software brand you own. These videos can be streamed from any computer or mobile device. Digitize 12 Designs Yourself using artwork we supply. Moving from simple to more complex, you’ll digitize 12 designs with help from John so you can better understand & retain the theory taught. 1 Certification Lesson. This is a final ‘test’ after you’ve completed Level 3. Here you’ll digitize a design completely by yourself using the theory you’ve learnt & send in your finished design to be evaluated by John personally. You’ll receive an official ‘Fill-Stitch Certificate” for completing the certification lesson. What Exactly Does this Level Cover? Learn how fill stitches react with the intended stitch direction & affect how smoothly your design stitches out. The principles of underlay values change based on material types and if a fill is standing alone or being outlined. Stitch direction plays a part in the objects staying true to its intended shape. Properly understanding how the density and stitch length properties affect the finish results will surprise you. You’ll learn how to digitize shapes and then properly outline them with a running stitch. This may sound like a simple task, but the theory covered while digitizing these more complex designs will ensure that you understand how to create a design that has perfect running stitch outlines without needing to run multiple samples. You’ll learn how to add satin stitche outlines to fills. This will give you cleaner & more professional looking designs. You’ll learn solid theory that will ensure you’ll never experience a “gapping” or “over-stitch” between two stitch types. You’ll learn that the fill stitch directly plays a huge part in how you adjust push and pull compensation. You’ll be able to ensure quality embroidery even when stitches directly oppose each other. Further explanation of underlay techniques will be covered. You’ll experiment with the creative aspects of fill stitches and learn more advanced elements such as variegated color blending. This level will also execute the practical theory we learned during the entire three level series to create a design with perfect underlay, density, push and pull compensation. Our goal from the very beginning is to learn how to create soft machine friendly designs that remain true to the artwork used. Cannot recommend these lessons enough. The digitizing course from Digitizing Made Easy is the best around, without question. Start at the beginning & work your way through. It will be money well spent. I quickly grasped the software & learnt so much more, to the extent that I was able to start up my own small business. Thanks to John Deer I now like digitizing more than actual embroidery. I bought the course from John & everything is explained so clearly. I learned so much. I’m starting to make my first few designs for paying customers while saving up for a bigger embroidery machine.Just start it people, you don’t know how fun it is until you give digitizing a try! You can do it! The lessons are very informative & John breaks it down into small sections that are easy to follow. I would highly recommend John’s digitizing course to anyone who wants to learn to digitize. My designs have improved considerably… finally everything has come together. John teaches you the way he was taught many years ago before the age of computers & brings it into the computer age. So why wouldn’t you want to learn from the Master? I am brand new to digitizing and recently purchased the interactive lessons. One of the first lessons was teaching digitizing of a floral heart - I was able to bring in the artwork, digitize the design and stitch it out on a kitchen towel! It stitched flawlessly! I am so impressed that within the first few lessons I was able to get something stitched! John Deer has been the most awarded embroidery digitizer in the world for over 20 years now. As a 4th generation embroiderer, John has an extremely unique history in the embroidery digitizing industry: he is one of the last 2 living Schiffli Masters in North America. John learned and apprenticed under Swiss Schiffli Master Digitizers (then known as “punchers”) over 30 years ago in his grandparent’s factory, before computers even entered the digitizing world. In the 1990’s-2000s John owned & ran one of North America’s largest commercial digitizing house, where he did the digitizing for many large corporations including: Disney, Coco-Cola, GM, the NFL, & the NBA. 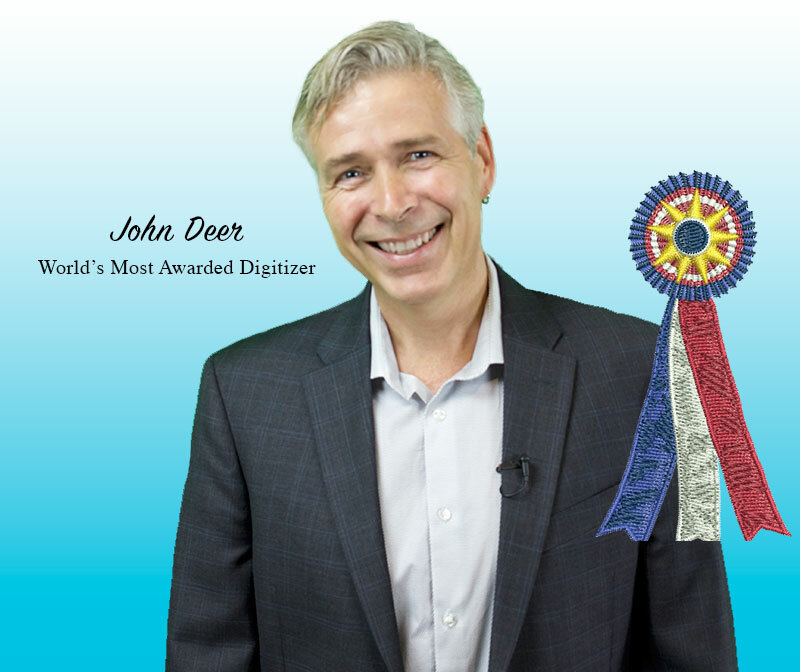 John has personally won 30 separate digitizing awards in the commercial industry and wrote the book on digitizing called “Digitizing Made Easy” which has sold over 42,000 copies & is used in Universities across the United States to teach those studying textile. Without understanding HOW an embroidery design is created, you won’t understand WHY your embroidery machine does what it does. The fundamentals taught in this course such as the stitch types being used, density, push / pull compensation & underlay are key towards the success of stitching ANY embroidery project. Save time & stop endlessly searching for the right designs: There are tons of embroidery designs out there. Yet how much time have you wasted trying to find the perfect design for a specific project? Stop looking. Start creating. Save money & stop paying others for designs: How much money have you wasted buying other people’s embroidery designs or paying someone else to create you something custom? Don’t let your software collect dust, invest in yourself today! You already know our lessons work. Finish the final step in learning the beautiful art of embroidery digitizing today.